It was with some trepidation that I awoke on Sunday morning. 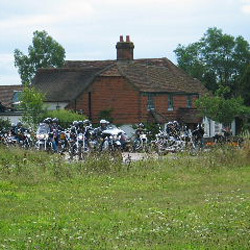 This was the day of the Chelsea & Fulham Olympic Poker run and, as with any social ride, the weather is a key element. The climatic variation of late has been, shall we say, somewhat erratic! Well the weather god was smiling on Chelsea & Fulham Chapter and Steve Beauchamp todays ride leader who along with Conor McAnally, Colin Houliston and myself had reseached and developed the run. It looked like the near perfect day with a few white cumulus nimbus to add variety to an otherwise blue sky. 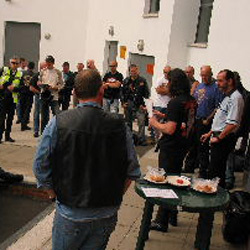 I’d agreed to meet Steve at Warr’s King’s Road showroom at 09.00 and was delighted to get a phone call from John B just before I left asking if he could join the ride as he had not joined the Chapter yet. He’d bought his bike from Warr’s and was a H.O.G. member so unbeknown to him he already was a member and of course we would be delighted to see him for his first ride with us. As it happens he was not alone and there would be at least 15 new faces at Warr’s that morning. I arrived at Warr’s for 09.00 and already there were several folk gathered. It’s always a relief to know you won’t be riding alone and Steve as ever was beaming. The riders continued to arrive in ones and twos and despite the holiday season we had a gathering of over 25 bikes for complimentary coffee and croissants kindly supplied by John Warr. John was there in person to give Steve some moral support as he gave his first Riders Briefing and despite the large number of new riders everyone took on board Steve’s words of wisdom. It should be noted that for the entire ride to the best of my knowledge not one drop off was missed or lifted prematurely and the riding formations would have done credit to the Red Arrows. To ride in a group that ordered with nothing but a sea of Harleys to front and rear is not just great fun it’s spectacular. Many thanks to Andrew Papas who handed out the first two cards of a poker hand to all the ride participants. In line with Conor’s theme for the ride the cards were round to make the five circles of the games. Deitmar Kohls our hard working Last Man made sure the ride book was completed and was there to check everyone was ready to leave. We left on time at 10.00 sharp with full tanks and empty bladders and tried a slightly different exit from the showroom onto the King’s Road. This was surely to be a measure of the thought Conor and Steve had put into the pre-ride recce. Our normal exit through Putney and onto the King’s Road went almost without hitch until Kiwi Hayden, accompanied by his charming wife Inga, had to pull into a Petrol Station with a suspected puncture. The ride pushed on as a Marshall was left to ascertain the damage. The ride down the A3 in the morning sunshine was smooth and the lane discipline exemplary. Steve had clearly thought out the problems we have had on occasion with the rides frequently changing lanes. Once past Kingston and onto the open road we headed out at a steady 65mph to beyond the M25 (yes it’s true ALL of Chelsea & Fulham’s April-November rides are outside the M25!). Leaving the A3 at Ripley we took a detour through the village to the delight of the locals. Again the road closure that caused this was picked up by Steve the previous day when he took one final recce. It had been open and without any warnings when Steve and I rode the official last recce the week before. 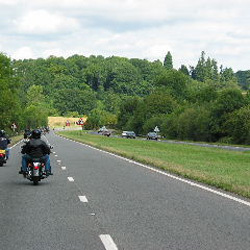 Back over the A3 and onto the famous Surrey twisties as we rode down tree lined B roads carefully avoiding the ‘wash off’ from the previous week’s storms. A brief trip along the A246 before turning again onto the country lanes that cross Ranmore Common. Dappled sunlight fell on sparkling chrome as our noble band rumbled through the dips and crests towards picturesque Abinger Hammer and its famous clock. From Abinger again onto the lanes for a brisk ride with hardly a straight in sight to the villages of Sutton Abinger and Holmbury St Mary where we were greeted by waving children and smiling adults. There really is something about a Harley that stirs the soul. On again for more twisties to arrive for coffee at the picture postcard Parrott Inn on Forest Green. Fresh coffee was ready for our 11.00 arrival and we were greeted by Landlord Jim who seemed delighted to welcome a group apparenty so far removed from his normal Sunday trade. Little did he realise several of our band can be seen in Chinos and loafers as often as leathers and boots. Andrew Papas again took charge of the card distribution. Fully refreshed we headed for Dorking down some of the best biking roads in the south of England. After a bit of choreographed dual carriageway work we arrived at the base of Box Hill and continued on up ‘The Switchback’. Here the views were just amazing and the pillion riders took full advantage as the shutters clicked to record our progress. I may even have been caught smiling by Terry Ferguson’s son James, lets hope not. A brief stop to distribute the fourth card and we were on again through sunny Headley and into Epsom past the famous horse racing course, fortunately not in use this weekend. The group was still good and tight as we came to our only real hold up of the day. Temporary lights and about two miles of frustrated car drivers. I was able to ride safely from the back to tell Steve that we were all together and he suggested we filter to the front. The road was wide and the visibility to see the sparse oncoming traffic was excellent. A marshal was sent on to warn of oncoming traffic and the manoeuvre went like clock work. As always the vast majority of car drivers were happy to let us have space and those that weren’t caused no problems. We passed under the A3, our escape route from the London traffic towards Esher and Claygate. 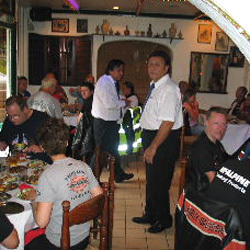 Here we had a appointment with the best Greek restaurant in the region, made famous by Chris Tarrant and Capital Radio team during the annual Help a London Child fundraising. Our tables were pre-laid as the restaurant had opened especially for the Chapter. I was joined by my wife Judi and our three children Robin, Guy and, well actually Harry stood in for Oliver who was away this weekend. What a brilliant or should I say smashing time we all had. The food was superb and just kept coming as we were entertained by the owner’s son who clearly was not inclined towards any washing up. Deitmar got in on the act with a few well timed “HOOPAS” while Wiggie recorded the smiling faces for posterity. Now the finale and Steve asked me to make the presentation. Terry Ferguson was the lucky winner with a flush from the twenty or thirty cards he seemed to have amassed (only joking Terry, Andrew Papas had been very strict with his card distribution). The prize giving over and after our thanks to John Warr for so completely sponsoring the Chapter we gathered outside for a brief photocall before drifting away fed, watered and content. Yet another excellent Chelsea & Fulham ride out.